This exhibition seeks to explore the role of visual production around protests and forms of resistance. It will consider such questions as: How does the mass media visually shape narratives? How does artwork respond to, reshape, interrogate, or blur these narratives? How does the visual response to protests and resistance movements by artists memorialize or historicize the events? Other artists included are Becci Davis, Malik Lloyd, Susanne Slavick, and the Tug Collective. 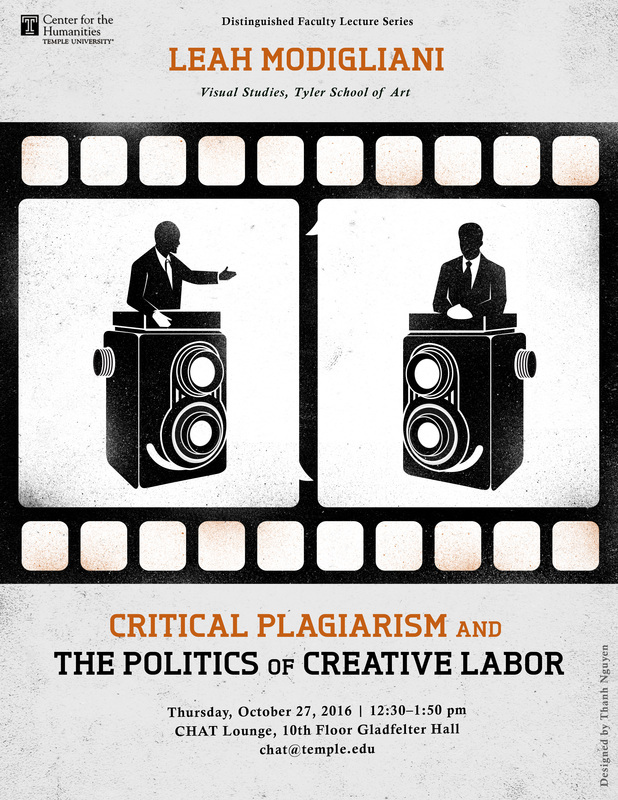 I will be presenting a paper about my art and writing titled Critical Plagiarism and the Politics of Creative Labor: Photographs, History, and Re-enactment in a roundtable at the UAAC conference at the University of Waterloo on October 26 from 11:00-12:30. The roundtable, Performing art criticism: new (materialist) research methods for contemporary art, was organized by Shana MacDonald and also includes Kimberley MCloud and Melanie Wilmink. Whether theorized as a puncture in one’s emotional life, as a mediation compelling or protecting from empathic response, as an indexical trace, or as manifestation of ideological construct, photographs are most often understood as evocative markers of the past; evidence of lost loves or labors. However, as Kaja Silverman has recently reminded us, photographs also present viewers with an image they can relate to now, an image analogous to our own condition. In this position paper, through the prism of my own work as an artist, historian and critic whose point of intellectual and creative departure is often a photograph, I follow Silverman’s renovation of the history of photography and add to it performance historian Rebecca Schneider’s proposition that we “think of the still [photograph] not as an artifact of non-returning time, but as situated in a live moment of its encounter that it, through its articulation as gesture or hail, predicts.” I understand this as an invitation to let time and embodied experience travel into the photograph, to allow the image to reveal the world to us now, to speak to our future. But how can one reenact a historical text as a living document that refuses to succumb to what Paige Sarlin described as “New Left-wing Melancholy;” that is the objectification of a historical social process into a contemporary commodity in the cultural realm. As Sarlin said, “What does it mean to be an artist who takes history as her subject?” What is my work? What is at stake? These are the threads I follow in this position paper. ​Jeff Wall sparked intense discussion about photography as art within artistic circles right from his first exhibition in 1978. By the 1990s, he had legitimized recognition of photography as art to the point that the question today is how his art conversely has influenced photography. Wall and his oeuvre are the starting point of the book Why Photography Matters as Art as Never Before (2008) by art historian Michael Fried, who focuses on Wall’s large format tableaus drawing on the art historical principal of history painting, as well as on Wall’s mise-en-scene in his fine art photography. Wall himself has led development of how his work is perceived through his critical pieces on fellow contemporary artists, his interviews, and artist statements. The symposium focuses on these reciprocal discussions, linking them to current art historical research into the latest fine art photography. Leah Modigliani: Washington D.C., 1939; Basel, 1957; Paris, 1958; Berkeley, 1969; Chicago, 1969; London, 1969; Windsor, 1983... is a solo exhibition of works by Leah Modigliani reflecting on themes of history, protest and power narrated through a feminist lens. Embedded within a discourse of representation, Modigliani challenges the ways in which political resistance has been disseminated and archived in popular culture. 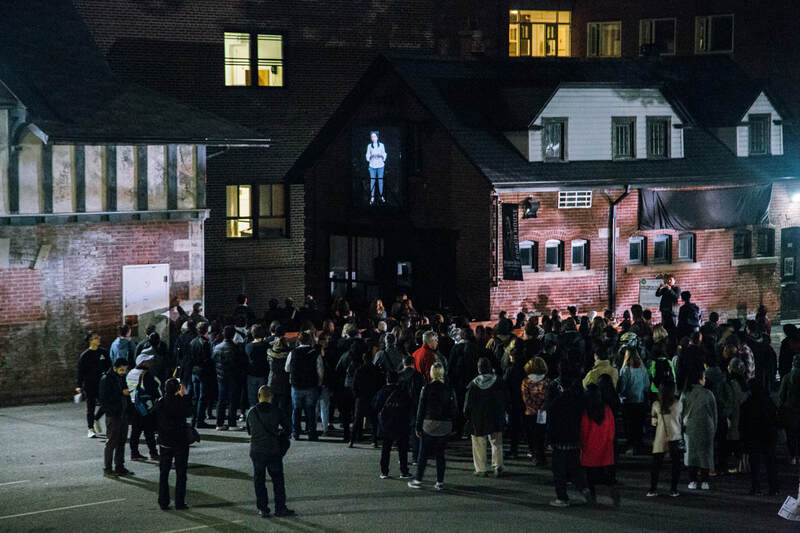 By reconstituting and reimaging moments of activism on white platforms inside the gallery, the artist is both commemorating these moments in history as well as exemplifying a material method for protest. Inevitably, the works also distort the events they make reference to, sometimes reducing them to the level of the commodity, to an easily acquired and consumed surrogate for political action, or into a staged performance-turned sculpture that remains frozen in time and place. However, in each instance, Modigliani has created a restorative gesture to critique the power of the photographic image, the document or the memory of history whose political efficacy remains an open question. This analysis of the origins of the Vancouver School of Photo Conceptualism in the late 1960s until its development as an international success in the 1990s, offers an innovative interpretation of avant-garde practice as a discursive manifestation of settler colonialism that establishes and replicates white masculine power amongst competing social bodies in peripheral locations, thus unsettling the “spacelessness” associated with global contemporary art. June 7 - August 27; opening reception June 7, 6-8 pm. 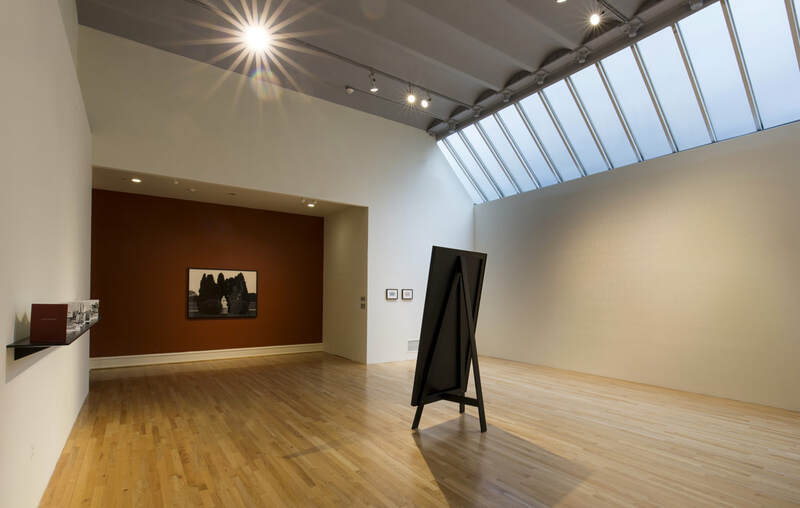 From the PAFA website: While at PAFA, the artist will delve into the institution’s history through its deep historical archives in the Center for the Study of the American Artist. Modigliani will create an installation based on the histories and the fates of two neoclassical figurative sculptures once commissioned to be donated to PAFA; William Wetmore Story’s Jerusalem in Her Desolation, 1873, (left) and G.B. Lombardi’s Deborah, 1873, (right). ​The fate of all cities, and the fragile promise of the social contract of equality for all, is the subject of this work, which tracks the banishment, disposal, and eventual reclamation of two important works of art. I'm pleased to announce my participation in a project organized by Joseph Del Pesco at Kadist, and developed with Oliver at The Present Group. It's based on a project called AddArt started by Steve Lambert in 2007. With a single click, you can install an add-on for any web browser that replaces advertising with visual essays by artists. Kadist invited artists to promote any non-profit endeavor, through the series of images they select or make... so the link (or "click-through" in advertising parlance) goes to a website chosen by the artist. There is also a contribution from RomettiCostales and new contributions from artists around the world each month. Follow this link if you are local and would like to apply. How long can we tolerate this? An incomplete record from 1933-1999 (2016) is a thirty-two foot long photo assemblage comprised of press photographs of evictions taken during the years of the Glass-Steagall Act. Assuming the form of a city skyline, it is at once a timeline, a historical archive and a representation of working and middle-class material displacement. In the context of an increasingly divisive 2016 federal election, this work speaks powerfully to the role the press plays in shaping political consensus about what constitutes a shared ethical responsibility towards others. The Glass-Steagall act was signed into law shortly after Franklin D. Roosevelt took office in 1933, and his inaugural address has been adapted to speak to the present in Modigliani’s work Only a Foolish Opportunist Can Deny the Dark Realities of the Moment: A Presidential Address (2016). The astute relevance of many of FDR’s words eighty-three years later, in conjunction with the past and present evictions of working class people remind us that democracy is a powerful symbol, an imperfect goal, and a work in progress. My essay The Snake and the Falcon has just been published in Anarchist Studies V23 No. 2, which includes content related to the British art historian Herbert Read's 1941 text To Hell with Culture. Opening Saturday Oct. 3 . 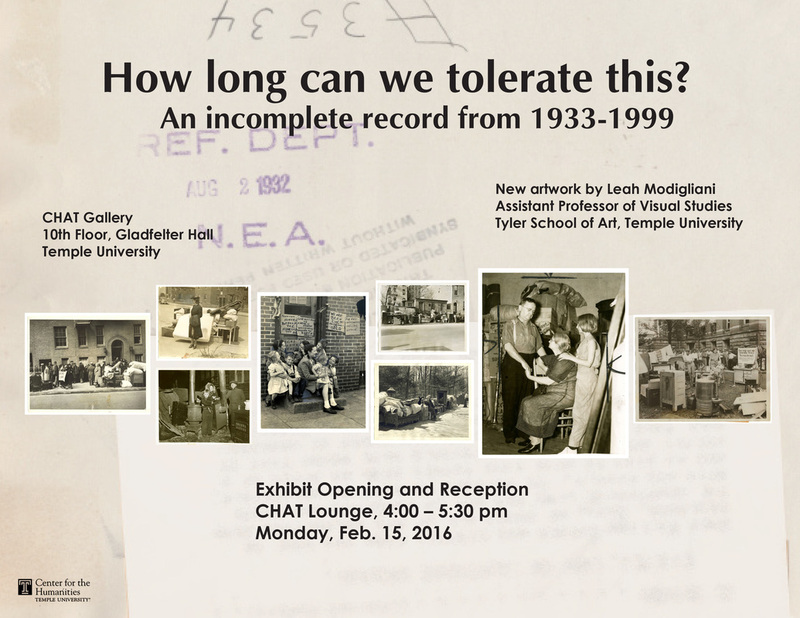 Opening the evening of Friday May 1, 2015. Artist Stephanie Syjuco and I are co-chairing a panel at the 2015 College Art Association: Should You Stay or Should You Go? Discussing the Debt to Asset Ratio of the MFA. All Together Now: The Real Question Is How Should We Pay for It? Creative Transition: What Might the Twenty-First-Century Art School Become? Issue 28 of Prefix Photo is launching next week and includes my essay The Invisible Giant in the Room: Jeff Wall's Pictures of Women. Other essays and writers in this issue are Rituals and Rupture: The Art of Adrian Paci by Mark Durden, Not in the Age of the Pharoahs by Bruce W. Ferguson, and The Pleasure of Hell on Earth by Eldon Garnet. Artists portfolios include work by Halil Altindere, Lara Baladi, Ahmed Basiony, Coco Fusco, Oliver Hartung, Jan Kempenaers, Amal Kenawy, Michael Love, Adrian Paci, Bahia Shehab, and Jeff Wall. I'm pleased to announce that I will be joining the faculty of Tyler School of Art at Temple University in Philadelphia as Assistant Professor of Visual Studies this summer. I look forward to new beginnings and new inspirations in Philadelphia! See Cmagazine 118 (Summer 2013) for my book review of The Last Art College: Nova Scotia College of Art and Design 1968-1978, Gary Neill Kennedy, MIT Press, 2012. Some of my hockey work is included in the exhibition curated by Eleanor King and Stefan Hancherow: The King and I: Hockey Bar at the Confederation Centre for the Arts in Charlottetown, PEI. I will be the respondent on the panel So It Is What It Is? with Susan Douglas (University of Guelph) and Anne Whitelaw (Concordia University) at the annual UAAC conference, Oct. 27-29. Feature essay titled Collaborating on Conceptual Art: an Aesthetics of the Impossible? in Cmagazine 110. 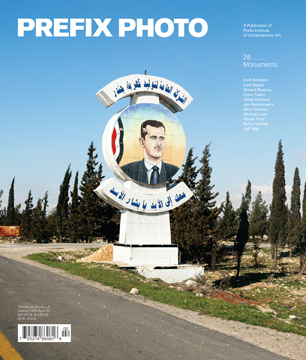 See the new issue of Prefix Photo 23 for my book review of Byproduct on the Excess of Embedded Art Practices, ed. Marisa Jahn, YYZ Books and REV, 2010. I will be speaking at the Nova Scotia College of Art and Design in the symposium that has been organized in conjunction with the large touring exhibition Traffic: Conceptual Art in Canada 1965-1980. I will be speaking at the University of Toronto in the symposium that has been organized in conjunction with the large touring exhibition Traffic: Conceptual Art in Canada 1965-1980.